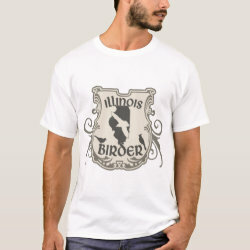 Show your Illinois Birder pride with this original shield-style design done in classic muted colors. The state is shown in silhouette with two passerines perched More... on either side and a gull in reverse silhouette flying above. This is great for native or local Illinois birders, or for anyone who has had the pleasure to bird the Land of Lincoln. From the Magic Hedge to the Shawnee National Forest, you'll fit right in with Illinois Birder swag!